Human anti cyclophilin A antibody, clone AbD00794 recognizes cyclophilin A, also known as peptidyl-prolyl cis/trans isomerase A, PPIA or rotamase A. Cyclophilin A is a ~18 kDa, ubiquitously distributed intracellular protein that can be secreted by cells in response to inflammatory stimuli (Jin et al. 2000). 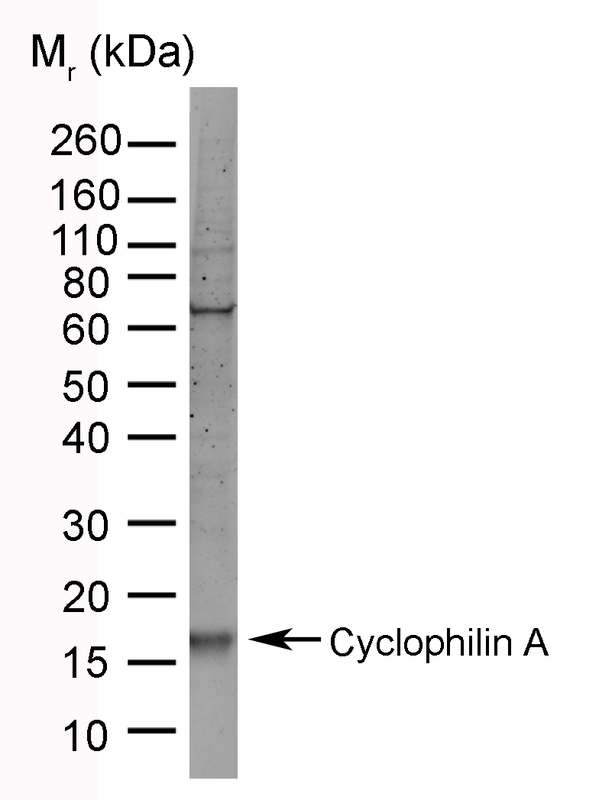 Cyclophilin A is a member of the immunophilin class of proteins that all possess peptidyl-prolyl cis/trans isomerase activity and, therefore, are believed to be involved in protein folding and/or intracellular protein transport (Fischer et al. 1989). This protein can interact with several HIV proteins including p55 gag, Vpr, and capsid protein. It has been shown to be necessary for the formation of infectious HIV virions (Franke et al. 1994). Cyclophilin is a specific high-affinity binding protein for the immunosuppressant agent cyclosporin A (Handschumacher et al. 1984). Because of its dramatic effects on decreasing morbidity and increasing survival rates in human transplants, the molecular mechanism of immunosuppression by cyclosporin A has been a matter of much interest (Durette et al. 1988). Multiple PPIA pseudogenes that map to different chromosomes have been reported. Multiple alternatively spliced transcript variants encoding distinct isoforms have been observed (Chatellard-Gruaz D et al. 1994). 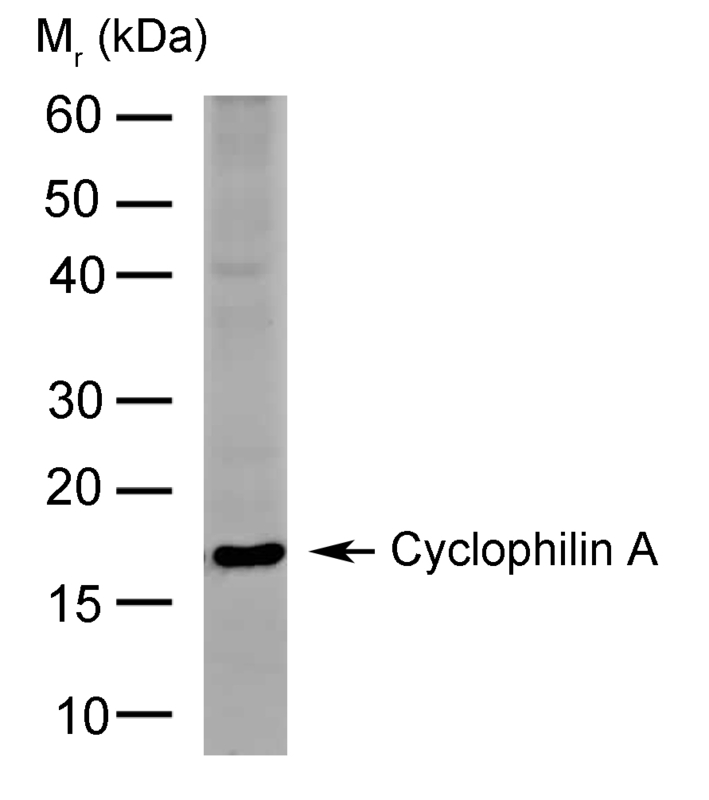 Mouse anti cyclophilin antibody, clone AbD00794 has been used successfully for the detection of cyclophilin A in HeLa cell lysates by Western blotting. A bivalent human recombinant Fab (lambda light chain) selected from the HuCAL® GOLD phage display library. Expressed in E. coli and purified using NiNTA affinity chromatography. This Fab fragment is dimerized via a helix-turn-helix motif. The antibody is tagged with a myc-tag (EQKLISEEDL) and a his-tag (HHHHHH) at the C-terminus of the antibody heavy chain. Activity was tested by indirect ELISA: recombinant purified Cyclophilin A (5 μg/ml) plus unrelated control proteins were immobilized on a microtiter plate. Specific binding was monitored by first adding HCA005 (2 μg/ml), then adding a secondary antibody (goat anti-human F(ab')2 fragment specific, AP conjugate. 1:5000 diluted). A fluorescent signal was created by adding the AP substrate Attophos. The signal on the antigen is at least 5-fold above background, whereas the signal on the control antigens is less than 1.5-fold above background. Purity was tested by SDS-PAGE and Coomassie-staining of a 2 μg sample. His-tag is a registered trademark of EMD Biosciences.